At Kingsbridge Private Hospital, our experienced HPC registered and CSP chartered physiotherapists can help people affected by illness, injury or disability through the use of exercise techniques, manual therapy, education and advice. 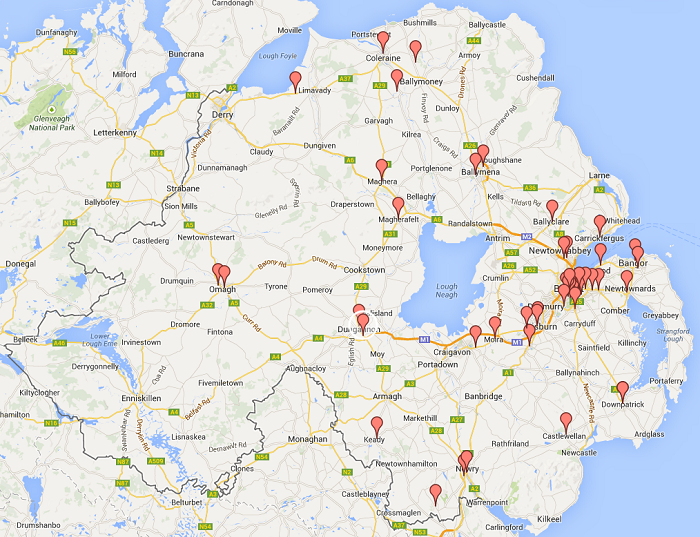 Click on the map image below to view a full list of the Physiotherapists we work with in Northern Ireland. At your appointment our physiotherapists will assess and establish your specific injuries or symptoms to build an accurate diagnosis. We then offer a completely personalised treatment plan, specific to your needs and aim to get you returned to your usual self in a timescale that will be made clear in the aims and objectives for treatment that our physiotherapists will set with you. Each treatment session will reassess the symptoms and aim for progress and should constantly change as your symptoms resolve. Once the symptoms start to resolve and function is returning, we offer advice on minimising the risk of recurrence of symptoms, e.g. advice on work postures, sporting postures and any biomechanical adjustments to maintain pain free function. If the symptoms do not respond to appropriate physio/rehab and we feel there may be a need for further input, we can recommend and facilitate efficient onward referrals for further investigations e.g. MRI, X-rays and to see consultants and physicians for diagnosis and possible surgery or treatment, thus offering a seamless service.